Dirty Vegas are back, and their new album is adequate! I caught Dirty Vegas in 2004 when they were the opening act for the Tears for Fears reunion tour, and they were absolutely electrifying. You might even say that they outshined the main event; though I'd attribute this mostly to nostalgic ticketholders lacking the patience to sit (stand?) through ten brand new songs from the Beatles of their big-haired adolescence. But I digress. Dirty Vegas had the crowd eating out of the palm of their hand. Steve Smith sang and slapped his tambourine like a monkey while the two unrelated Harrises kept the good vibes flowing from their instruments, neither upstaging their singer nor behaving like cold robots. They didn't even need to play their Mitsubishi commercial hit song "Days Go By", though its inclusion didn't hurt. The point is that Dirty Vegas had the stage presence that made people not care what they were playing. It was just fun. So imagine my surprise when I get around to hearing the new release they were promoting at the time, a sophomore album oddly titled One. If their eponymous debut showed some promise, then One was a slump all around. For reasons that I'm sure made sense to Smith, Harris, and Harris at the time, Dirty Vegas turned their late-night dance-party moodiness into generic alterna-slush. The music bore no resemblance to the three guys I saw on stage in 2004. There were One posters all over the walls of the venue's bathroom that night, celebrating its eminent US release. But if the same album were to come from a bunch of underground unknowns, no one certainly would have given a damn. 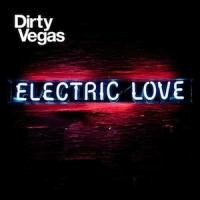 Dirty Vegas wisely took a break and have resurfaced with Electric Love. Is it worthy of the energizing performance that I and so many others witnessed years ago? That's a fair question, and a fair answer would be: sort of. For every song that succeeds as a catchy bridge between synth pop and club beat, there is another song that sounds like 15-year-old constipated La Bouche. So while Dirty Vegas spend roughly half the album making up for One's wussy shortcomings, the rest of Electric Love harmlessly flounders. Let's call it an improvement. This observation probably doesn't matter in the thick of the digital age, but Electric Love is frontloaded. If you’re one of those people who still listens to an album from front to back, you stand to get a better first impression than if you were to set the album on shuffle. "Little White Doves", "Changes", "Electric Love", "Emma", and "Never Enough" all glide so easily on the rails of a tight-as-bolts rhythm track that you easily forget the lyrical banalities (no one listens to this kind of thing for the lyrical content anyway... unless it's the Pet Shop Boys). The guitars and synths have an equal amount of bounce to them, furthering Dirty Vegas's cause of making dance music more accessible. These strengths are more buried than ignored on "Today" and "21st Century", but by the time you reach "Weekend" you are in generictronica territory. The tail-chasing instrumental "Round and Round", which is a fitting title when you think about it, is likely meant to end the album in the middle of a forward momentum. But the overall impression already constructed from this and previous tracks just point to repetition, repetition, repetition. And yes, dance music is meant to lure you into a groove with repetition. The Africans figured that out centuries ago. But when it comes to expensively produced electro-pop, some supplemental traits have to be there. And with half of Electric Love, Dirty Vegas rises to the occasion. But like I said, this is a big improvement over the flaccid One, so let's hope that Dirty Vegas keeps moving. Then we'd have ten awesome tracks on one album.